A new low-wage industry study [Broken Laws, Unprotected Workers. Violations of Employment and Labor Laws in America’s Cities] by the Center for Urban Economic Development, the National Employment Law Project, and the UCLA Institute for Research on Labor and Employment exposes the dark side of workforce exploitation in America’s three largest cities – New York, Los Angeles and Chicago. From January through August 2008, researchers conducted 90-minute interviews with 4,387 “front-line” workers, aged 18 or older, using “innovative, rigorous methodology” to reach vulnerable people “often missed in standard surveys, such as (undocumented) immigrants and those paid in cash.” The goal was to be as statistically representative of workplace violations as possible for a population of about 1.64 million workers, or 15% of the total workforce studied. The report documented flagrant workplace violations, core protections most Americans take for granted, including a guaranteed minimum wage, overtime pay, regular meal and other breaks, worker compensation for on-the-job injuries, and the right to bargain collectively for better wages, benefits, and working conditions. — some workers denied legal protection by being classified as independent contractors. Workplace violations varied by industry and job type. 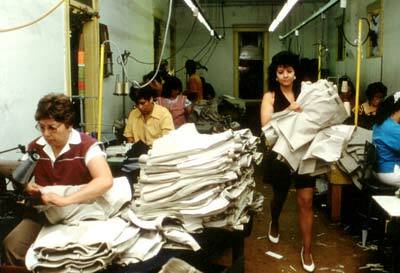 Abuses were most common in apparel and textile manufacturing, personal and repair services, and private household employment. They were much lower in residential construction, social assistance, education, and home health care, and somewhat frequent at restaurants, retail and grocery stores, and warehouses. Workers getting a flat weekly wage or cash experienced high violation rates compared to those paid a regular hourly rate or by company check. Workers in firms with under 100 employees were more at risk than those at larger companies, but not all employers were scofflaws. Immigrants, women, the foreign born, and others in vulnerable categories were most at risk, but all workers (even the better educated) face potential workplace abuses against which they can get little redress. Weekly wage theft affects over two-thirds of workers, costing them an average 15% of their pay. — other categories, including finance and other health care services. In February 2009, Amish Markets, a leading New York gourmet grocery chain, agreed to pay nearly $1.5 million in unpaid wages to 550 workers. In the same month, the Los Angeles city attorney filed criminal charges against the owners of four car washes for failure to pay minimum wages and grant employees breaks. In Chicago, a large temporary staffing agency settled a class action suit by paying over 3,300 employees nearly half a million dollars. In 2008, Wal-Mart settled 63 “off-the-clock” abuse cases in 42 states totaling $352 million in unpaid wages to hundreds of thousands of current and former employees. More details below. In the same year, a court-appointed official awarded more than 200 FedEx drivers $14.4 million for being illegally classified as independent contractors. In large and small companies alike, these examples are commonplace, disturbing, and deteriorating further during hard economic times as recent reports suggest. Working Americans nationwide face increased exploitation as layoffs and cost cutting force unacceptable demands on them, unlikely to be easily reversed. Labor laws since the New Deal aren’t working. They’re not enforced, have been greatly weakened, are out of date, exempt some industries and occupations partially or entirely, and leave the most vulnerable, like immigrants, minorities and women, subject to exploitation. — 77% of Los Angeles workers were denied or got a shortened rest break. — 6% of tipped workers were paid below their legal minimum wage. Employers must pay all workers (full or part-time, documented or undocumented) at or above federal or state minimum wages, whichever is higher. Yet 26% of those surveyed were underpaid, and the amounts weren’t trivial as 60% lost on average $1.43 per hour. The Fair Labor Standards Act (FLSA) mandates “time and a half” pay for all covered employees for weekly hours worked exceeding 40. Yet 73% of “at risk” workers weren’t paid the legally required rate, and 19% overall were unpaid or underpaid for overtime. This is work taking place before or after regular shifts. Employers are legally required to pay for all hours worked. Yet often they take advantage and don’t. By law, New York, California and Illinois require employers to provide uninterrupted meal breaks for workers, although their length varies by state. Yet violations were frequent and took a variety of forms, including no break one or more times, shorter ones than mandated, employer interruptions, and having to work part of the time. As outlined above, they included late payments, no pay stubs, illegal deductions, and “tip stealing” from tipped workers. — 21% were otherwise harassed, abused, or given increased workloads. Laws vary by state, but in most cases employers must contribute to state worker compensation funds and carry insurance to cover the costs of on-the-job injuries or illnesses. Yet only 8% of injured workers during the previous three years filed a claim for their most recent injury, a clear sign that the system is dysfunctional because of how employers work it to their advantage. Around 43% of seriously injured workers said they were required to work in spite of it. Another 30% said their employer refused any help, 13% were fired shortly afterward, 10% were required to be at work even if unable to perform their duties, and 3% were told not to file a claim. In the past three years, about 50% of respondents suffering an on-the-job injury experienced a worker comp violation for their most recent one. Only 55% of those seriously injured sought treatment, and only 40% of those said their employers paid all or part of their medical bills. Only 6% of injured workers had company insurance cover their medical expenses as required. Minimum wage violations vary significantly – most flagrantly in apparel and textile manufacturing, personal and repair services, and private households; less often in residential construction, social assistance, education, and home health care. Other industries fall somewhere in between. Violations also vary by job category. Faring worst are child care workers, beauty, dry cleaning and general repair workers, and those employed as sewing and garment workers. Best off are general construction workers, waiters, cafeteria workers, bartenders, and teachers’ assistants. Overall, 64% of workers got hourly wages. The rest received either a flat weekly or daily amount. Non-hourly workers fared worst as well as those paid in cash, not company checks, and “piece rate” employees, subjected to unattainable productivity levels to earn minimum wages. In addition, companies with less than 100 employees had almost double the violations rate of larger firms. Overtime violations occur frequently as 76% of respondents exceeding 40 hours work during the previous week were denied time-and-a-half pay as required. Non-hourly workers fared worst, especially with jobs in personal and repair services, private households, retail and drug stores, and home health care. Best off were food and furniture manufacturing, transportation, and warehousing employees. Again, companies with under 100 employees were the most flagrant violators. Off-the-clock violations were also commonplace, affecting 70% of workers surveyed, unpaid for exceeding their regular shifts, especially in private households, social assistance, and home health care jobs. Not surprisingly, US-born workers and those best educated fared best, undocumented foreign-born ones (especially Latinos) worst, and women experienced more violations than men over minimum wages. In contrast, overtime, off-the-clock, and meal break violations varied much less demographically. As noted above, it steals 15% of worker wages amounting to $2,634 annually on an average $17,616 total earnings. Also in a given week, over 1.1 million workers in the three cities studied experienced at least one pay-related violation costing them over $56 million in total – mostly over unpaid minimum wages but also the above cited abuses. The problem is endemic in key industries throughout the country, and has a profound effect on workers, their families and communities. The cities studied aren’t unique as evidence nationwide suggests. Low-wage worker rights are compromised in jobs ranging from agriculture, meat and poultry processing, hotels, nursing homes, day care centers, retailing, and residential construction in every city where exploitive day labor hiring sites exist. Ending employer abuses depends on strengthening labor laws and having federal and local governments enforce them. However, since passage of the landmark 1935 National Labor Relations (Wagner) Act, workers have been disadvantaged ever since, more than ever today at a time of weak unions, empowered companies, and an economic crisis letting employers cut jobs, wages and benefits freely, and have government turn a blind eye to their most egregious violations. Fixing these problems needs new leadership in charge of mass organizing, building unity and strength of numbers, and educating workers on what they’ve lost and how to win it back. In a globalized corporate world and hostile governments, workers must go on the offensive, take to the streets, go on strike, hold boycotts, demand more from elected officials, replace unresponsive ones, and battle the old-fashioned way for fair labor laws and government officials they can count on for enforcement. Short of that, labor rights will keep deteriorating until workers across the board are totally at the mercy of unscrupulous employers, while government remains indifferent to their plight. Conditions are well eroded already, and nothing short of total mass-commitment has a chance to reverse it. With over $400 billion in sales and about 2.1 million employees, the company ranks third globally in the 2009 Fortune 500 rankings behind Royal Dutch Shell and Exxon Mobil. In 2008, Wal-Mart’s average full-time Associate, its most common position, earned $10.84 an hour (for a 34-hour week) or an annual income of $19,165, $2,000 below the federal poverty line for a family of four. According to the US Bureau of Labor Statistics (May 2, 2008), the average full-time Wal-Mart Associate last year earned 16% less than the average retail wage. At the same time, its CEO Lee Scott (January 2000 – January 2009) earned $29.7 million in total compensation. On December 23, 2008, the company announced that it settled 63 wage and hour class action lawsuits, representing about 86% of the 73 total pending. Through evidence obtained and employee testimonies, these cases revealed company ruthlessness in keeping labor costs down and unions out. Legal documents showed that managers are rewarded for forcing employees to work off-the-clock, skip meal and rest breaks, then manipulate time and wage records to cut costs. They also overwork minors and keep them during school hours. An internal July 2000 company audit revealed that these violations were longstanding. Company executives engaged in illegal activity and hid the evidence to avoid liability. Under terms of the settlement, Wal-Mart agreed pay at least $352 million and perhaps as much as $640 million to present and former employees. According to Professor Paul Secunda of Marquette’s School of Law, the company settled to avoid an even worse defeat, including what unionization might cost.